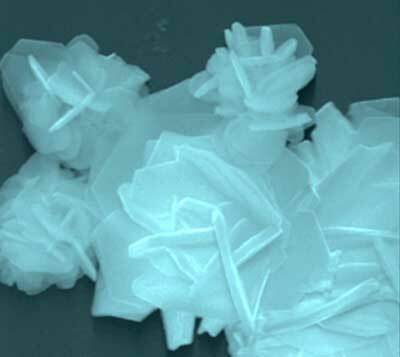 (Nanowerk News) Scientists at Rice University and the Lawrence Livermore National Laboratory have predicted and created new two-dimensional electrocatalysts to extract hydrogen from water with high performance and low cost. Several catalysts were modeled by Rice theoretical physicist Boris Yakobson and lead author Yuanyue Liu, a former graduate student in his lab, and made and tested by Rice materials scientists led by Pulickel Ajayan and Jun Lou. They found the new dichalcogenide catalysts matched the efficiency of platinum -- the most common hydrogen evolution reaction (HER) catalyst in water-splitting cells -- and can be made at a fraction of the cost. 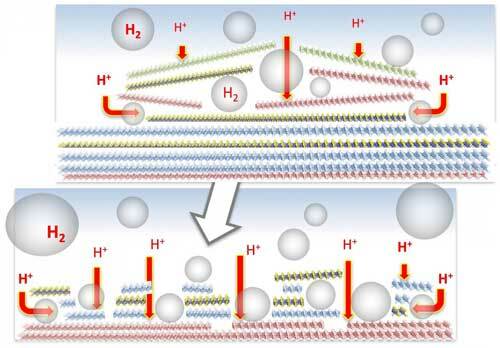 The study appears in Nature Energy ("Self-optimizing, highly surface-active layered metal dichalcogenide catalysts for hydrogen evolution"). Scientists who have been testing molybdenum and tungsten dichalcogenides as possible HER catalysts were frustrated to find the active sites tended to concentrate at the metal platelets' edges, a small percentage of the material's surface. It turned out the hydrogen produced along the planes did something unexpected to make the materials even more effective. "The process generates hydrogen bubbles between the layers, which starts to break them apart," Yakobson said. "This makes the layers more accessible and increases the number of active sites." Liu said performance enhancements in both electrocatalysts were directly related to changes in the materials' physical shape despite no observed changes in their chemical or crystal properties. "This work is a good combination of theory and experiment," said Liu, who began the project during a 2013 fellowship at Lawrence Livermore. "We first analyzed why the old catalysts -- molybdenum and tungsten dichalcogenides -- do not work well and used this understanding to predict new catalysts. We then turned to our experimental colleagues, who successfully made and tested the materials and verified our predictions." Yakobson said Liu's method to model the material may be as important as the material itself. "Yuanyue in effect created a new shorthand way to evaluate the catalytic performance," he said. "The old-fashioned way was to directly compute the binding energy of the reactant, like hydrogen, to the surface. Instead, we chose the property of the catalyst itself to serve as the descriptor -- without having to worry about what was absorbed. "This work is a rare example of the Materials Genome Initiative in action," he said. "The theory develops a descriptor to speed-search among numerous material possibilities and to accelerate discovery compared with trial-and-error experimentation." The initiative is a federal program to speed the discovery and implementation of advanced materials. The researchers expect the materials' self-optimizing behavior will have practical advantages for scalable processing. "Finding surface-active catalysts in layered materials is a significant step forward for hydrogen production using non-noble metal catalysts," said co-author Lou, a professor of materials science and nanoengineering and of chemistry. "It is also very important that such surface activities could be directly verified experimentally, paving the way for future applications."